From Huntington Beach to Manly Beach: The Australian Open of Surfing and the Manly Beach Skateboard Bowl contest. Best Runs: Bob Bunrquist, Renton Miller, Pedro Barros. 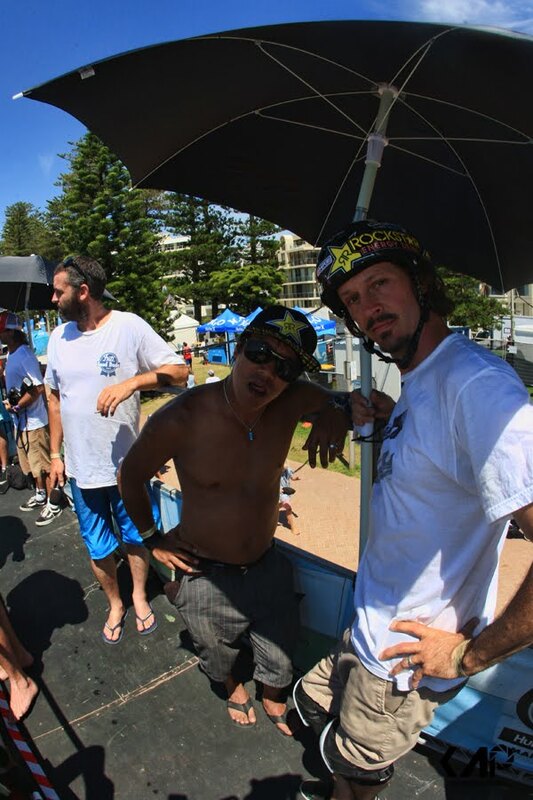 The first Annual Beach Bowl event at the Australian Open of Surfing (AOS) was a huge success. Skaters from Australia and all over the globe made the trip to Manly beach to compete for the $50,000 US prize purse. The boys had done a stellar job in getting the 12ft skate bowl ready and mother nature was on our side and delivered clear and sunny skies for the week. Friday was set for practice sessions while everyone got their lines sorted and getting comfortable with the bowl. There was some amazing moves being thrown down - Mctwists, 540 stale fishes, kick-flip indies, back-to-back 540s, switch-tricks and huge lien airs! Saturday was the open day of competition and if it wasn’t hot enough already, the worlds best skaters were going to heat things up even more! The Junior skaters at the event were on fire with the youngest competitor (and newly signed Hurley team rider) Keegan Palmer aged 8 years of age. Lil Poppy Starr Olsen showed why she’s the best womens skater in the country, aged only 11 years was laying down some fine lines carving the bowl and tweaking big airs. Lachie was skating with a vengeance and every one of the younger riders were pushing each other hard. Ryan and Jakob were showing why they’re on top of their game but were out-classed by the birthday boy – Lachie Abbott in the finals of the AM event. 16-year-old Curren Caples traded the wetsuit and surfboard for the skatey and was sliding the rail pad-less and helmet-free! He was blasting huge airs at break-neck speeds. Brazilians Pedro Barros and Bob Burnquist launched an aerial assault of epic proportions and were displaying some of the best switch riding around. Burnquist qualified second for the men’s final, with crowd favourite Barros topping the scoresheets with a series of back-to-back 540s, kick-flip indies and some serious air-time. The masters were putting it all on the line and were definitely NOT showing their age. Mik Mulhall & Adam Luxford from Sydney were giving it to the international riders carving the bowl and launching airs well above the coping. Josh Rodriguez (USA), Rune Glifberg (DEN) and Kevin Kowalksi (USA), Pedro was absolutely freakish and out-classed the field by laying down huge tweaked lien airs mixed switch tricks back-to-back 540’s. Pedro took the top honours with runners-up Josh Stafford and Bucky Lasek to take the inaugural Beach Bowl title. The ultra smooth style and consistency of Nicky Guerrero earned him first place in the Masters Division ahead of podium finishers Sergie Ventura (USA) and Eddie ‘El Gato’ Elguera (USA). Congratulations to Pedro Barros, Nicky Guerrero & Lachie Abbott on taking the top podium spots in the Pro, Masters and AM divisions. who landed and fat backflip to take the title. Special mention goes to Sam Beckett who nailed a backside tailslide to shuvit out on the extension and Bob Burnquist who stomped a body varial (Burntwist) in front of the judges. It was a fantastic end to a great week of skating on the beach at Manly which will feature as an annual event on the calendar. of the biggest star, is continuing to destroy everything in his path by sweeping the first 2 of 3 events Down Under. 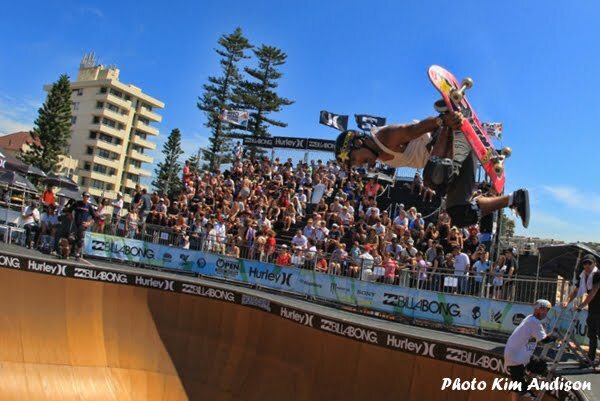 Right after the final runs of the Manly Beach Bowl contest during the Australia Opens of Surfing in Sydney (Australia) on Sunday evening, Facebook was quickly filled with Portuguese from Brazil cheering their two biggest skateboard stars: Bob Burnquist and Pedro Barros. Pedrinho, as he is known in Brazil where is is one of the biggest star, is continuing to destroy everything in his path by sweeping the first 2 of 3 events Down Under. Pedro dominated the Beach Bowl from start to finish with his full speed power attack! Take a look at some of the best runs during the Manly Beach Bowl final of the Australian Open of Surfing. From Huntington Beach to Manly Beach: The Australian Open of Surfing and the Manly Beach Skateboard Bowl contest. Interviews with Bob Bunrquist, Renton Miller, Pedro Barros, Curren Caples.